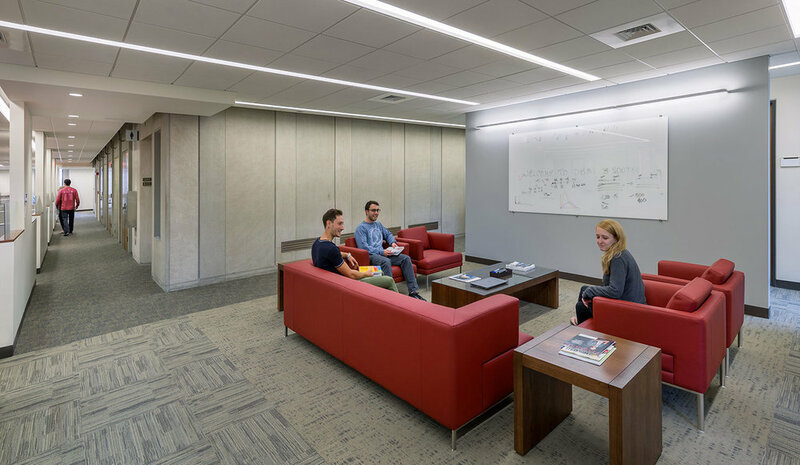 Creating a variety of work spaces for students, faculty, researchers and staff that optimize interaction with bioinformatics librarians was the central goal of our renovations of Harvard Medical School’s Francis A. Countway Library. Our renovations reconfigured floor layouts and interior design while respecting the iconic 1960's architecture of the 112,000 sf building. Typical of much of our library projects, our renovations to Countway Library converted areas that previously housed stacks into new spaces for people to work—collaboratively or as individuals—and interact with a variety of media. Phase 1 renovations created individual carrels and librarian service stations interspersed throughout reading areas and stacks. We created enhanced group study spaces and lounges, expanded workstation areas, and new conference and break rooms. Materials were reorganized, prioritizing recent periodicals, hard-copy materials, increased high-density filing, and off-site storage at the Harvard Depository. Phase 2 involved the renovation of existing stacks on the third floor, creating private, shared and semi-private offices for Administrative staff, PI’s and Post Docs. MDS is currently designing renovations to create the Countway Cafe, to be located on the ground level, adjacent to the main entrance.